One of the best parts about being a writer is what inspired me last week; seeing a project come together beautifully. The notes from my Critique Sisters arrived as well as the notes of my wonderfully supportive friend Carolina and I spent the week entering them then doing a final read through out loud to my ever helpful other half. It feels good, solid, and compelling, it feels done. Well, not done in the sense that I won't have to edit again once I get an agent (because one almost always has to edit upon signing with an agent), but highly polished and ready to submit. Yep, To Ride A Puca is out on submission! Whoo hoo! Now that I've hit send on the very first submission I think I shall go throw up. Just kidding, the submission butterflies migrate after you've been doing this for a while. At least until the requests start coming in. Then it's nervousville all over again and the butterflies start hatching in my tummy. Speaking of querying, this Wednesday I'll be posting my query letter at the Critique Sisters Corner for feedback and to help others with the query refining process. Be sure to stop by! For an in depth discussion on querying join us tonight on the #WritersRoad chat on twitter at 6:00pm PT. So what am I going to do next? This weekend I'm off to Washington for the SCBWI Western Washington conference and a much needed visit with my Critique Sisters. My sisters and I will raise a glass to celebrate then I'll crack down and get conferencing. After that I'll listen to whatever music strikes my fancy, read many of the great books that have been sitting patiently on my to be read pile, and allow the steampunk novel that's percolating in my head to start to take form. 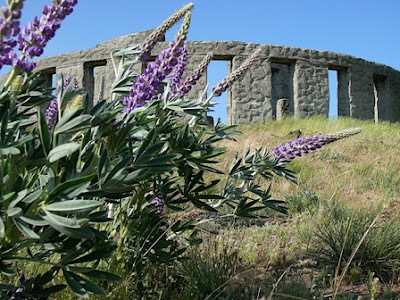 By the way, the picture is of a replica of Stonehenge in Washington. congrats. It is always a little nerve racking sending stuff out for others to see. Good luck with the submissions! I know those requests are going to start pouring in! And have a great time at the conference - it sounds fantastic! Congratulations Heather on the final edits! Your story is so good... I want to publish it. A winner for sure. Looking forward to seeing you and your reading your query on Wednesday! And I'll see you in Seattle on Friday for a great and successful weekend! Congratulations, Heather, on a great week's (topping off many months)work! Enjoy the well-deserved butterflies of the pleasant variety. See you in five days—yay! Karlene, you are far too sweet! I look forward to your feedback on my query and cannot wait to see you this weekend! Linda, thank you, it has been a hard road. I can't wait to come celebrate with you and Karlene! Ghenet, thank you so much, for the congrats and good wishes! Heya, I was just browsing through the entries on the Love YA blog. I think yours is good, but you have a pretty big anachronism off the start. Your story takes place in the 12th century but telescopes weren't invented until 1608, five hundred years later. Shannon, thank you so much! How wonderful to start querying your new work of art. All the best. I am so excited for you, Linda, and Karlene getting together again. Hugs to all of you! Have a wonderful time. Michael, thank you, you're so sweet! We can hardly wait for out interview with you! I was just wondering if that was Stonehenge, but something seemed off about it. I visited Stonehenge early 2009. It was such a sunny day when I went, and something seemed weird about that to me. Anyway, so excited for you, Heather! Such a lovely story. Awesome title, too. Can't wait to hear your good news, too. It's gonna come, dear. So I've got my confetti ready and waiting. Carolina, thank you a million times over! Your confidence gives me strength and courage! THAT'S SO EXCITING! I can't wait to check out your query letter and to hear (read) your good news! You are a wonderful writer and I know I'll be on my way to Barnes and Noble to buy one of your books someday soon! (I'll have to send it to you to get it signed!) :0) Christy Oh, and enjoy the conference and time with friends! Can't wait to peek at your notes! Congratulations on getting those revisions done, and all the best to you with your submissions! Thank you Christy! I am uber excited. I look forward to your thoughts on my query letter this Wednesday! And don't worry, of course I'll take lots of notes so I have a ton to tell you when I get back from the conference! Good luck with the querying, Heather. Querying is one of the scariest things to do. Enjoy the conference. I know a number of writers from my city who are headed there too. Stina, thank you! It really is, but unfortunately, it's one of the necessities. Tell your friends to say hi! Congrats!!! That's awesome. I wish you best of luck. Have a great time at the conference too, it sounds like fun. Thanks Lisa! I'm excited, both for the conference and being out on submission!